Born February 7, 1477, Thomas More followed the family profession by becoming a lawyer. It was not an easy decision. He had also seriously considered the priesthood perhaps joining the Franciscans. But, in the end, he opted for law, saying he’d rather be a good husband than a bad priest. In 1501, Thomas was elected to Parliament and soon spoke out against the monetary demands of King Henry VII. His criticism earned his family house arrest, and he vowed not to put his family through such a situation again. His intelligence and skill attracted the attention of the next King, Henry VIII. Henry VIII often visited the lawyer’s home, so they became friends and Thomas More was named Chancellor. But the friendship was strained when Henry wanted his marriage to Katerin of Aragon annuled so that he could marry Anne Boleyn. In 1534, Thomas More refused to recognize the supremacy of Henry VIII on spiritual matters. More was arrested and all his possessions confiscated. On July 6, 1535, Thomas More was beheaded. 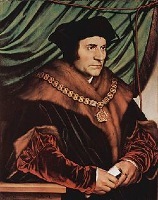 Thomas More was beatified in 1886, and canonized in 1935.